Affirm, Inc., the company started by Max Levchin to offer fair and honest financial products, today announced it has partnered with Alltran, Inc to offer Affirm’s customers the best customer service experience in the financial services industry and will be creating up to 150 new jobs in its world-class customer service center located in Bryan, Texas. 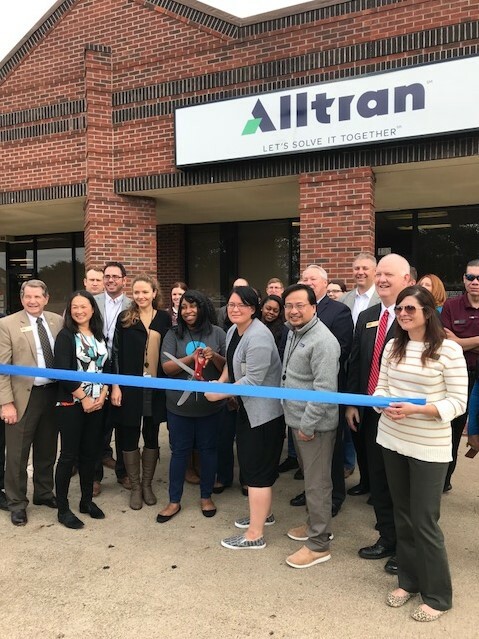 To celebrate the partnership, the Bryan Chamber of Commerce conducted a ribbon-cutting ceremony today at the Alltran center of excellence in Bryan, TX. Affirm selected Alltran based on shared values of transparency and simplicity as well as ensuring the best interests of the customer always comes first. The partnership aims to utilize Alltran’s technical and operational resources to drive overall customer satisfaction. “We are delighted with our partnership with Affirm,” said Kevin Keleghan, Chief Executive Officer of Alltran. “This partnership embodies our company slogan, Let’s Solve It Together. With Affirm, we have pulled together a state of the art customer service solution”. “We are excited to offer our customers the best customer service and be able to create great jobs right here at home in the United States,” remarked Huey Lin, Chief Operating Officer of Affirm. “We hope folks in the Bryan, Texas area will consider joining Alltran and help Affirm in its mission to deliver honest financial products that improve lives. Alltran specializes in revenue cycle, accounts receivable and contact center solutions within the Healthcare, Financial Services, Higher Education, and Government industries. Alltran has over 2,200 employees and operates several facilities throughout the US- Sartell, MN; Gaithersburg, MD; Woodridge, IL; Bryan, TX, Tulsa OK and Houston, TX. Affirm offers services that empower consumers to advance their financial well-being. Our goal is to revolutionize the banking industry to be more accountable and accessible to consumers. Today, Affirm shoppers get the flexibility to buy now and make simple monthly payments for their purchases. Unlike payment options that have compounding interest and unexpected costs, Affirm shows customers upfront exactly what they’ll owe—with no hidden fees and no surprises. Affirm also reaches a broader population of consumers through advanced technology and analytics that look beyond traditional FICO scores. These features increase customer satisfaction over other options.